(Leisure time). Overnight at Selected Hotel. 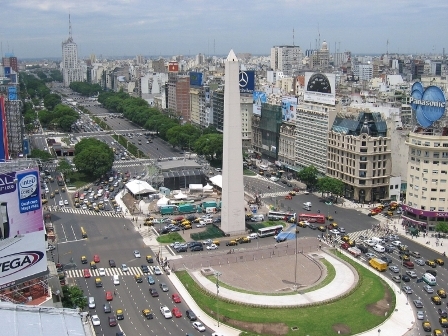 Pick up from the Hotel at the morning,A three and a half hour sightseeing tour visiting the Plaza de Mayo, the Government House, the Cathedral, Columbus Square, La Boca district, San Martin Square, Santa Fé Avenue, Recoleta Cemetery, Grand Bourg Square, Palermo Chico district, Polo grounds, Horse Race Track, Palermo Park, Rose Garden, Libertador Avenue, Congress Hall, 9 de Julio Avenue, and the famous Colon Opera House, with lunch included - without beverages - Overnight at Selected Hotel. Breakfast at Hotel, Pick up from the Hotel in the morning .This tour will offer a different way to explore and enjoy the nature, very close to the city. On the way north to Tigre, which is about 30 km away from Buenos Aires, and one of the biggest Deltas in the world, you will go through one of the most beautiful accesses downtown, passing by residential suburban neighbourhoods with their calm narrow roads, Yacht clubs, and mansions. Departing from Tigre's pier, on board of a typical island launch, the green labyrinth of channels and streams will open its doors to let you explore the nature of its islands, enjoying the views of beautiful riverside villas, Victorian docks, English gardens, and traditional rowing and boating clubs. For more that 100 years, the maze of rivers and channels of the Tigre Delta have been a favourite weekend gateway for "porteños". During this relaxing off-site, you will leave the bustling city behind and enter a world that has changed little since the 1920s. Breakfast at Hotel, At the time Private transfer to the International Airport. Round trip transportations, Accommodations at selected hotel with daily breakfast. regular services with Spanish / English speaking guide.